This example creates a window with some checkboxes and radio buttons. ** Copyright 2017-2019 Double Precision, Inc.
** See COPYING for distribution information. // the "Train" radio button is selected, or not. // actual label, so this works out nicely. // our responsibility to show() the new display element. // the "Train" radio button, that's installed below. // Whether the radio button is now selected. // And update the label for the "Train"
// factored out for readability. // In the first column of each row put a checkbox. // of the day of the week. // Create a radio button group, to tie all the radio buttons together. // Append more columns to row #0. // Create the "Train" button, initially set. // And the "set" label. // Set this radio button. // Whenever this checkbox is enabled, the "sunday" and "saturday"
// button is the set state, we'll disable them right off the bat. // references to the saturday and sunday display elements. // elements to be destroyed as well. // display element, and this obviously needs to be a weak reference. // Ignore this for the initial callback. // Recover the weak reference. // Now, run the main logic of this callback. // Append more columns to row #1. // Create a "bus" radio button and label. // that are taken up by the radio buttons. // with some extra spacing above it. // is equivalent to clicking on the "Train" radio button. // The parameter to label_for must be a focusable display element. // Read the final values of the days of week checkbox. A factory's create_checkbox() and create_radio() and methods return an x::w::image_button, which is a focusable. Creating a radio button requires creating a x::w::radio_group separately, and passing it as the first parameter to create_radio() when creating a radio button for that radio button group. Radio buttons in the same radio button group are mutually exclusive with each other. The application has no further need to keep track of the x::w::radio_group object after creating all the radio buttons. Each radio button maintains its own internal link with the radio group object. Traditionally, a brief text label appears next to each x::w::image_button. The first parameter to create_checkbox() and the second parameter to create_radio() is a closure, or a callable object. The callable object receives one parameter: a factory that the closure should use to create one display element. The label, like any other display element, must be show()n to be visible. It is possible to use create_label() to construct a lengthy, word-wrapped label for an x::w::image_button, which appears immediately after it. By default, the button and its following label are vertically centered with respect to each other. This may not look very well with tall labels. The last optional parameter to create_checkbox() and create_radio() is an x::w::image_button_appearance object, a reference-counted object. Actually it's an x::w::const_image_button_appearance that references a const object. This is a common LibCXXW design pattern: an “appearance object”. This object specifies various appearance-related properties of a display element. The default appearance object is cached, which is why it is a constant object. An appearance object's modify() creates a duplicate copy of the appearance object, which can then be modified without impacting the cached copy. checkbox_theme() and radio_theme() return the default appearance objects for checkboxes and radio buttons. This example takes the default checkbox_theme() and modify()s it. This appearance object's alignment member adjusts the vertical alignment of the label display element with respect to the checkbox or the radio button. Note that the button and its label is a single display element, in the button's container. It's always possible to create a label separately, as a discrete display element: the factory parameter to create_checkbox() and create_radio() is optional. Without it, this results in a x::w::image_button all by itself: a small, clickable button. It's presumed that the label display element gets created independently, as a discrete display element of its own. The appearance object is also an optional parameter that overrides the checkbox_theme() or radio_theme() parameter. Both the factory and the appearance object parameters are individually optional. If both parameters get specified, it's required to specify them in this order. checkradio.C creates a bottom_label, an ordinary label. label_for()'s parameter is any focusable, like our x::w::image_button. label_for() specifies that a pointer click on its object's display element (the display element whose label_for()) has the same effect as a pointer click on the parameter display element. 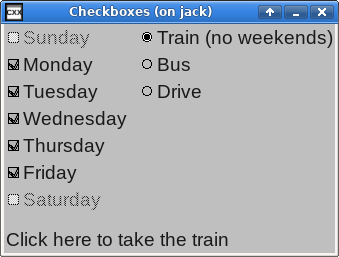 In this case, clicking on the bottom_label has the same effect as click on the train radio button. Clicking on the label element results in the pointer click getting processed by the focusable element. The label's visual appearance also matches the focusable's visual appearance when the focusable gets enabled or disabled by its set_enabled() method. It is possible to define two or more labels for the same focusable; but a given label can be a label for only one focusable. Finally, setting a (modified) appearance object's images setting loads custom checkbox or radio button images. See the section called “Custom images for checkbox and radio buttons” for more information.